In recent years, the heroin and opioid epidemics have surfaced through the news as major public health issues, bringing increased awareness of the negative effects of illicit drug use. Among these effects is the increased spread of certain vaccine-preventable viruses and diseases, including the hepatitis B Virus (HBV). According to The U.S. Department of Health and Human Services (HHS), some regions affected by the epidemics experienced a 114% increase in HBV infection rates from 2006 to 2013. Drug use aside, HHS reports that an estimated 850,000 to 2.2 million people are living with HBV nationwide. With HBV vaccines available, clinicians and healthcare advocates can play a role in helping increase immunization rates and curb the spread of hepatitis B. According to Immunize.org, HBV is spread through skin contact or exchange of bodily fluids. The Centers for Disease Control and Prevention (CDC) states on its website that there are two types of HBV, acute hepatitis B and chronic hepatitis B, that cause infections ranging in severity and duration of illness. In some cases, HBV can be a life-threatening disease, causing scarring of the organ, liver failure or even cancer. Adults aged 20 to 49 are the most commonly affected by the disease. HBV can be difficult to diagnose as 67% of infected people are unaware of their condition and show no symptoms, according to HHS. There is currently no cure for hepatitis B, making vaccination critical to lessening its impact. In 1997, CDC recommended hepatitis B vaccination for all children under 18 years old, yet many adults still have not received or have not successfully completed this vaccination, reports the Hepatitis B Foundation. HHS reports that only 25% of adults are fully vaccinated against HBV. In an effort to change that and combat viral hepatitis in the United States, the organization developed the National Hepatitis Action Plan for 2017-2020, which includes prevention as its first goal. Given the challenge of increasing HBV vaccination uptake among the large majority of American adults, vaccine researchers and manufacturers have developed one particular vaccine specifically for adults that were not immunized as children. In February, the Advisory Committee on Immunization Practices (ACIP) added Heplisav-B® (HepB-CpG) to its recommended immunization schedule for adults aged 19 years and older. According to the CDC, this vaccine is recommended for any adult who has not been vaccinated against hepatitis B and includes specific recommendations based on sexual activity, diabetic status, vocational exposure to blood or viruses, and drug-injection methods. 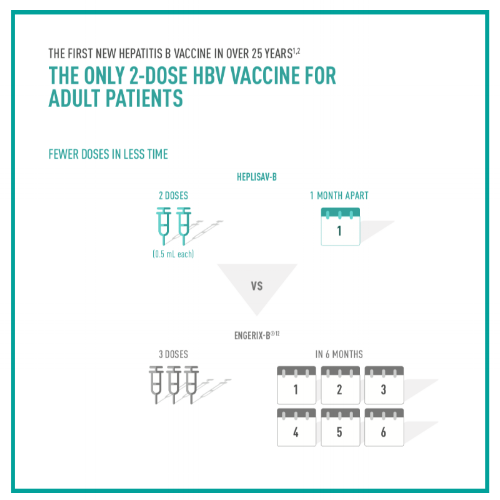 The Heplisav-B vaccine is the first and only adult two-dose series for hepatitis B. The two doses are administered at least 4 weeks apart from one another, according to materials published by Dynavax and the CDC. With one less dose than previously available hepatitis B vaccines, Heplisav-B has the potential to improve adult vaccination rates, according to the HHS website. HHS advocates that strong immunization programs will be the key to improving vaccination uptake among the remaining 75% of adults who are vulnerable to HBV. Healthcare providers serving adult populations are likely to encounter patients for whom HBV vaccination is recommended. As healthcare experts and advocates, clinicians have the opportunity to educate patients, screen for disease, and discuss immunization status to help keep adult patients healthy. Atlantic Health Partners is proud to partner with Dynavax to make the Heplisav-B vaccine available for purchase. Please contact us for more information about placing orders.